Even though the U.S. economy officially came out of recession in mid-2009, do you wonder why it doesn’t feel that way? There may be a lot of reasons, but I think the continued turmoil of the residential real estate market is one of the key factors. The housing market and mortgage industry may not be as messy as it was in 2008 and 2009, but it’s still messy. TARP, HAMP and other government policies and programs may have stabilized the banking system and the financial markets, but the financial situation of many homeowners hasn’t improved much in the past five years… and for many, it’s gotten worse. As this article cites, Zillow estimates approximately 16 million (one-third of all U.S. homeowners) owe more than their homes are worth (a.k.a. underwater). It’s quite discouraging to think that after years of slugging through this challenging economy, you might be further behind today than you were five years ago. Some areas of the country have definitely been hit much harder than others, but on a national basis, if you have positive equity in your house, one of your neighbors does not. 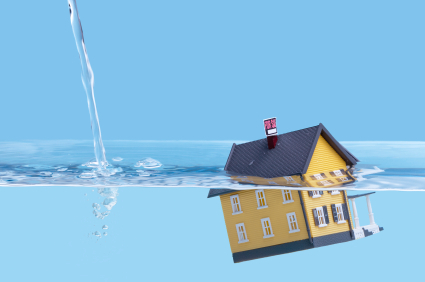 In Las Vegas, where I live, even though thousands of people have lost their homes to foreclosure and values have decreased by approximately 50% from the peak, a whopping seven out of ten homeowners are still underwater. There are significant economic implications for having so many homes underwater. It impacts people’s ability to relocate, puts them in a perilous financial position if their income decreases, limits their ability to refinance, and pares back their spending. However, I think the most significant factor is the psychological effect it has on their outlook about the economy, the nation and their future. For many people, their homes represent a significant portion of their wealth. They may have spent years saving up for a downpayment or building the equity in their home, and it’s frustrating to see it wiped out in a matter of months. Granted there were some people who bought homes they shouldn’t have, took out mortgages they couldn’t afford or treated their home like a personal piggy bank. However, for millions of Americans, they simply bought at the wrong time and their homes lost value through no fault of their own. The psychological effects of the mortgage mess should not be underestimated. Owning a home is considered to be part of the American Dream. It’s one of the reasons home ownership is much higher in the U.S. than in many other industrialized nations. Sadly, the dream of millions of Americans turned into a nightmare. Consequently, it’s only logical for people to feel apprehensive and fearful of the economy and the future, when something they thought was a sure thing (owning their home), turned out to be much more uncertain than they could have imagined. Furthermore, home ownership is a very personal matter. It’s unlike any other investment, because it’s the place where your family connects and memories are made. Unlike the empty promises politicians often make, I won’t say there is an easy solution to the mess, nor do I think it’s likely to get cleaned up any time soon. If there were an easy solution, it would have already been done by now. Therefore, I think it’s going to be a long and arduous process to reduce the number of homeowners who are underwater. Consequently, I don’t think we’ll see a resurgence in optimism about the economy, until the number of underwater homes is dramatically reduced. It’s hard to feel positive about the future when you feel insecure or afraid of losing the place where you live and raise your family.